A study recently published in the Journal of Photonics for Energy demonstrates how to convert a luminescent solar concentrator into an energy-harvesting laser phosphor display by projecting intensity modulated light. The journal is published by SPIE, the international society for optics and photonics. The study is a unique and novel application of a luminescent solar concentrator for display applications. 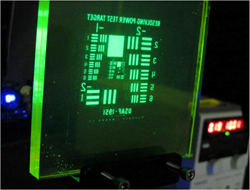 By replacing the phosphor screen in a laser phosphor display (LPD) with a luminescent solar concentrator (LSC), one can harvest energy from ambient light as well as display high-resolution images. “Energy-harvesting laser phosphor display and its design considerations,” published recently by SPIE, the international society for optics and photonics, in the Journal of Photonics for Energy, describes the development, processes, and applications of an LPD. In a proof-of-concept experiment, lead author Ichiro Fujieda and his colleagues at Ritsumeikan University fabricated a 95 × 95 × 10 mm screen by sandwiching a thin layer of coumarin 6 with two transparent plates. These plates guided the photoluminescent (PL) photons emitted in both directions toward their edge surfaces. After removing the light source in a DMD-based commercial grade projector and feeding a blue laser beam into its optics, the screen generated green images. Attaching a photodiode with a 10 × 10 mm sensitive area on the bottom edge of the screen to record the power of the PL photons indicated that a fully covered version would harvest up to 71% of the incoming optical power. However, a ghost image was noticeable when displaying a high-contrast still image. The researchers address two aspects in their design considerations. First, tiling small modules and extracting the PL photons in each module reduces the thickness of a large-area system and alleviates the effect of self-absorption. For seamless tiling, attaching an output coupler to the wave guiding plate and mounting solar cells provides an optimal solution. Second, the origin of the ghost image is the PL photons reflecting at the interface between the rear plate and the outside environment. By reducing the thickness of the rear plate on the LPD, they were able to eliminate this optical cross-talk between pixels. Coauthors are Shunsuke Itaya, Masamichi Ohta, Yuuki Hirai, and Takamasa Kohmoto. Zakya Kafafi, adjunct professor in the Department of Electrical and Computer Engineering of Lehigh University, is editor-in-chief of the Journal of Photonics for Energy. Launched in 2011, Journal of Photonics for Energy is published digitally in the SPIE Digital Library and in print. The journal covers fundamental and applied research areas focused on the applications of photonics for renewable energy harvesting, conversion, storage, distribution, monitoring, consumption, and efficient usage. The SPIE Digital Library contains more than 458,000 articles from SPIE journals, proceedings, and books, with approximately 18,000 new research papers added each year. Abstracts are freely searchable, and a number of journal articles are published with open access.